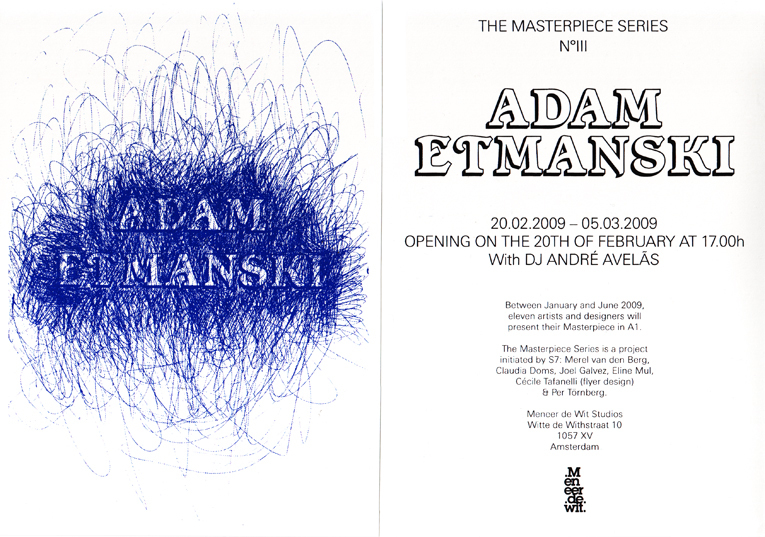 11 artists and designers were asked to make a work in the size of A1 with the title masterpiece. 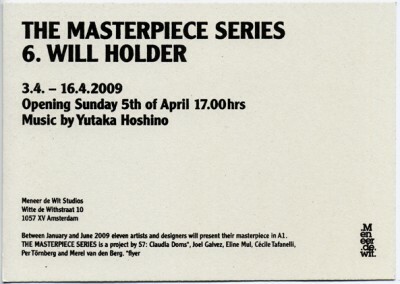 Between January and June 2009 these works will be presented in a 2-weeks-cycle, introduced with a small opening ceremony. 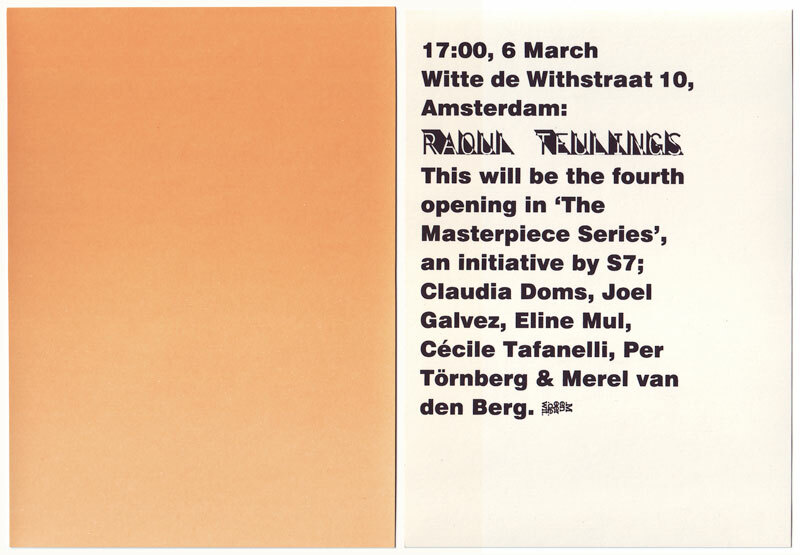 THE MASTERPIECE SERIES is a project by Claudia Doms — in collaboration with Merel van den Berg, Joel Galvez, Veronique de Koning, Eline Mul, Cécile Tafanelli and Per Törnberg. 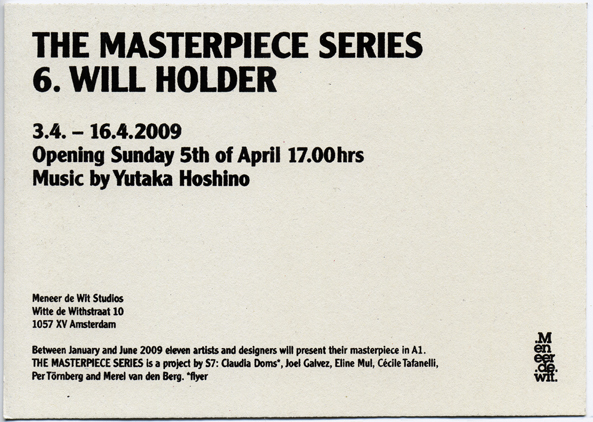 The Masterpiece Series is a changing exhibition in the showcase of Meneer de Wit. 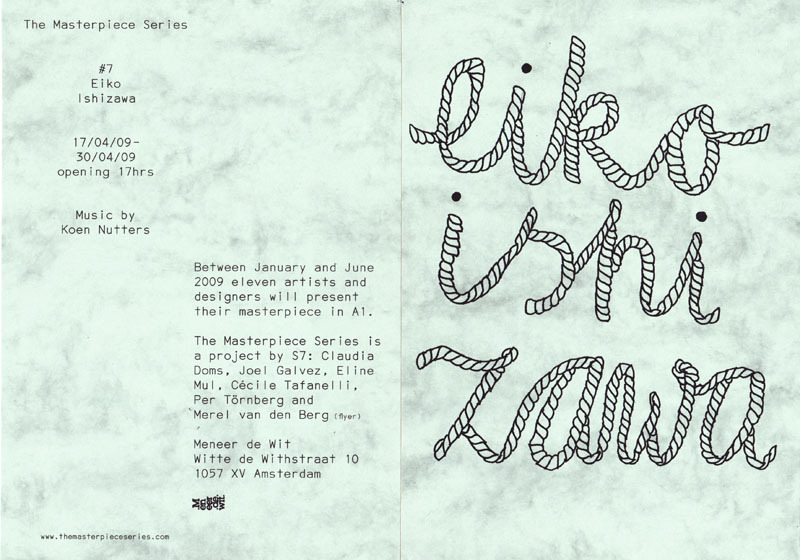 11 artists & designers were asked to make a Masterpiece in A1 format. 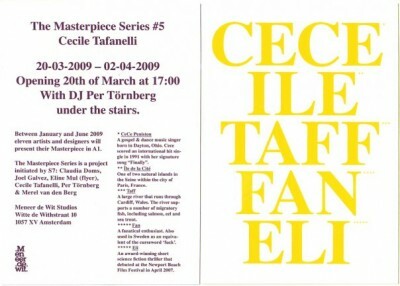 There were no restrictions concerning content and technique. 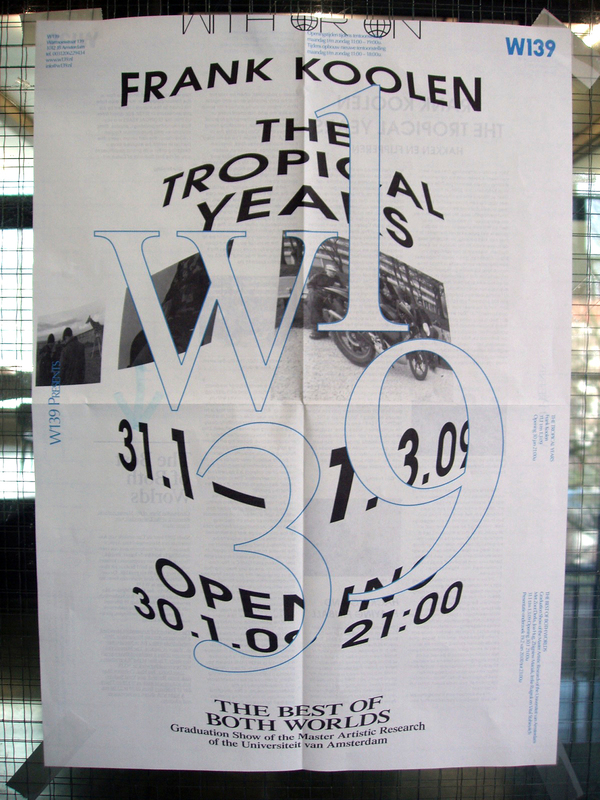 Between January and June 2009 these works will be presented in a 2-weeks-cycle in the showcase of Meneer de Wit and will be accompanied by a grand opening. You are very welcome to join us for the opening on Friday the 20th of March at 17:00h at Witte de Withstraat 10. 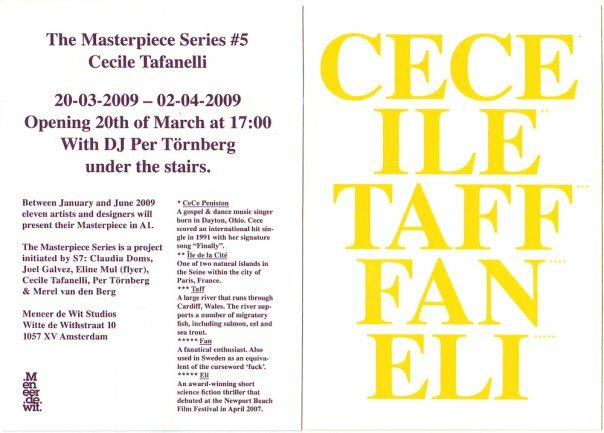 It is impossible to consciously produce a masterpiece, since it is a cultural term which posteriorly defines an existing work of art as such. A masterpiece is like a step-stone in art history books, it defines an era, an art movement, and often it transcends it. But again it is a cultural term invented to vulgarise art-history for popular culture, therefore so-called masterpieces often become cliché (to speak of painters; almost all Van Gogh, Impressionist painters, Klimt, Leonardo da Vinci and Renaissance iconic paintings, Dali, Matisse, Rothko, Miro, Hopper and many others that we can find reproduced in many waiting-rooms around the world, for obvious aesthetic reasons). 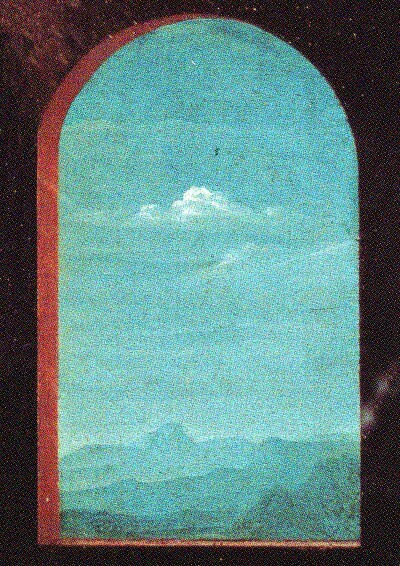 I chose to work with a painting from Leonardo da Vinci, but possibly finished by one of his students: Giovanni Antonio Boltraffio. The painting is called Madonna Litta (1490). The Renaissance period of art-history began in Italy at the end of the XIV century and spread throughout Europe. It creates a sort of loop in art-history, jumping over the Middle Ages but also propping itself upon it, to rediscover antique arts and themes—especially Greek and Roman mythology. Renaissance painting also widely uses biblical imagery and classical themes (pieta, nativity, annunciation), but frees itself from the religious aspirations of Gothic painting by introducing a humanist purpose to the painting which spreads a sense of happiness, ideals, peace and progress. This ideological progress will be linked to technical progress as well, with the use of perspective, chiaroscuro, sfumato and so on. Renaissance is also the start of what is called the early Modern Age, as well as the birth of the status of the artist as we still know it today. 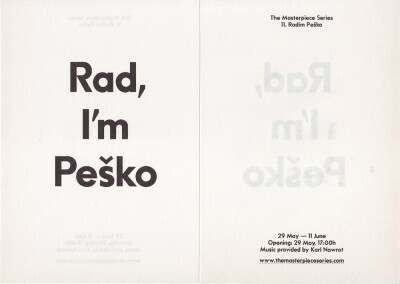 Renaissance is thought of as being a ‘digested’ period, because we are now in what is called the Postmodern world. We are very proud to present a masterpiece in A1 by Raoul Teulings! 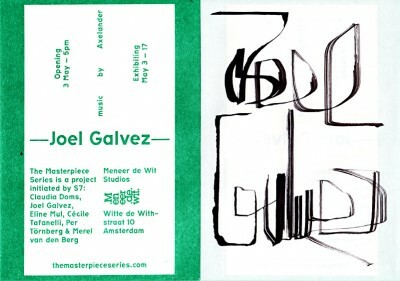 Please join us for the opening on Friday, March 6th, 17:00h, Meneer de Wit Studios, Witte de Withstraat 10. TRUE TRUE TRUE is very happy to present three new books. Available now thru www.truetruetrue.org, soon thru select bookstores, and Thursday 29th at the Amsterdam book launch! 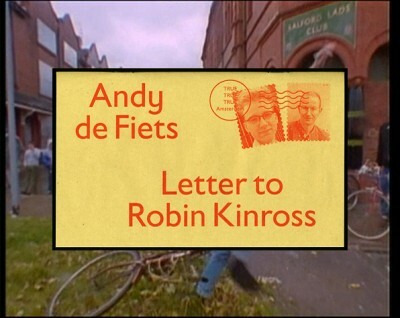 22-year-old Andy de Fiets, on the verge of graduating from his graphic design studies, writes to his hero: Hyphen Press publisher Robin Kinross. 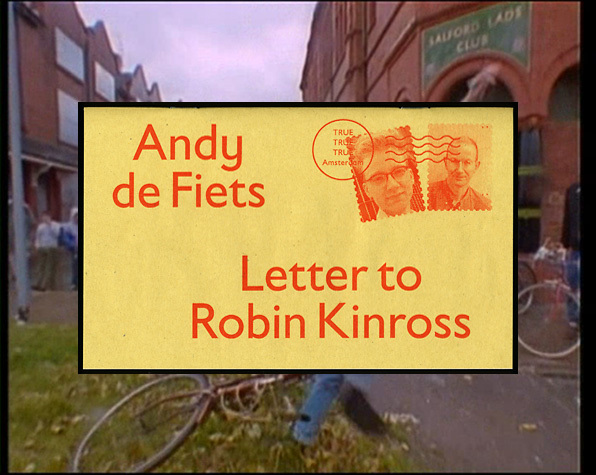 Andy offers unsolicited advice, seeks much-needed guidance, and shares his thoughts on matters such as typography, The Smiths, Islamic fundamentalism, proper clothing, the homeless, dust covers. Andy spots every comma but misses every point. 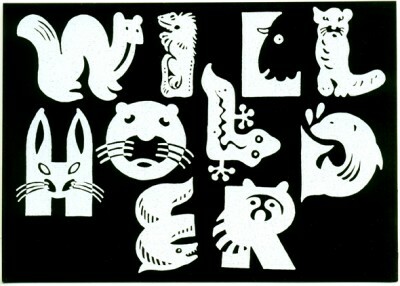 A delightful typographic comedy! Following the June release of LITTLE TITANS, here are four of Nescio’s very short pieces, bittersweetly capturing epiphanies in the Dutch landscape. Written between 1914 and 1943. * Please let us know if you would rather not receive any e-mails in the future.